This page covers the basics of the Internet. There are several different ways to get online, here’s a few. Build your own site from scratch or get someone to build one (Your web site). Make your pages in a community site using templates (MySpace, Band Camp). Make your pages on a retail site using templates (CD Baby). In practice it can make sense to use several different locations online for different purposes. Most people are on Facebook and Twitter but personal accounts may not be suitable for music. It’s normal for MySpace bands to have their own site too, and although a MySpace blog is OK it’s no match for a specialised blog like WordPress, TypePad or Blogger. Alongside those you might also use a CD Baby page for CD sales and also keep a presence on an upload review site like Garageband. Depending how you set things up and what you want to do there’s more information on these pages. a credit card gateway to take payments. ISP (Internet service provider) free upwards You’ve probably got an ISP already if you’re looking at this page on the web. Web host or Registrar free upwards For email addresses @ your site—you can use names that forward to another email address or full POP3 email accounts with your registrar or host. 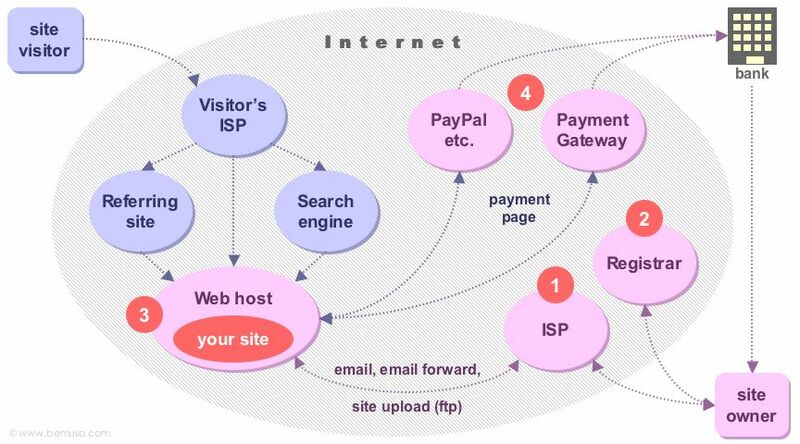 Web host or Registrar free upwards Web forwarding redirects visitors to a different URL, e.g. www.bemuso.co.uk is forwarded to the dot com address. Registrar up to £10 p.a. You can check whether your name is available using a Whois site. When you register it takes up to 24 hours from submission to confirmation that the name is yours. Web host free upwards Your web host will provide name server addresses to connect your name registration to your site. You need to enter these in your registrar account. It takes up to 72 hours for the name server changes to take effect (they call this propagation). Your site may appear sporadically during this time. Web host free upwards Your web host will provide an ftp host name, account user name and password so you can upload your pages. They’ll tell you where to put your home page and what to call it (Apache servers accept default.html or .htm, and index.html or .htm). There are other ways to take payments for mail order, including cheques by post and special coded pages, e.g. for PayPal (Online payment services). To take payments for downloads you can use Payloadz. There are two kinds of search engines: directories and indexes. Some search engines are a combination of both. It’s hard to place a site in a directory unless it has a single traditional function (such as a record shop). Indexes provide search results based on page structure and word density—they’re good but not perfect. Directories (e.g. Open Directory Project) are like yellow pages, organised into site categories. You normally have to put your URL in the right place and provide a description or keywords. Indexes (e.g. Google) make lists of keywords from your pages and use them to respond to searches. They’re compiled by software called crawlers, spiders or robots and they all work in a slightly different way. site builders are always trying to distort search results in their favour. It’s an arms race between the search engines trying to be comprehensive and web businesses trying to get more hits. We don’t really know how good they are at what they do unless we compare results. Are there things some engines can’t find? Search engines that charge are really in the advertising business and frequently suggest sites that have nothing to do with your search. People search to see what’s there, not to see adverts. Google is still the biggest name and gets the most traffic but it is overwhelmed by spam and almost any search assumes you are shopping. Ask is a far better search engine these days. So expect people to use Google but be more selective for your own searches. As Google has grown its crawl-rate has also declined. The most frequent crawlers (and so the most up-to-date) for this site are now Yahoo!, MSN and Ask. The Search engines page has more about submissions.